City National Nevada has announced it is supporting the Shriners Hospitals for Children Open golf tournament with a $6,500 Champions Club sponsorship. The tournament runs Oct. 31 through Nov. 6, with all proceeds benefiting Shriners Hospitals for Children. The player field consists of 132 PGA professionals, including this past year’s champion, Smylie Kaufman. The tournament will be played at TPC Summerlin, which is a par-71, 7,223-yard course designed by Bobby Weed and player consultant Fuzzy Zoeller. Epicurean Charitable Foundation of Las Vegas hosts the third annual Strikes for Scholarships bowling tournament fundraiser from 9 a.m. to noon on Aug. 28 at South Point, 9777 Las Vegas Blvd. S.
Registration is $35 for individuals, and $125 for teams of five. Participants may sign up to bowl individually, as a team or bid to play with a participating celebrity. Proceeds support the foundation’s scholarships to high school students seeking hospitality, and food and beverage industry careers. Tickets and sponsorship information are available at ecflv.org. Clark County Social Services referred an elderly widower on a fixed income in need of air-conditioning and running water to his home to the Sunny Plumber and Goettl Air Conditioning for help. Members of Bishop Gorman’s football team, the Sunny Plumber and Goettl Air Conditioning helped fix the homeowner’s plumbing problems, air-conditioning and things around his house. Goettl Air Conditioning donated $2,000 in materials and services to fix the air-conditioning. The Sunny Plumber donated $6,000 in materials and services to fix the plumbing and installed a new, comfort-height toilet, perfect for the resident, given his limited mobility. Nevada Realtors are teaming up with Boys &Girls Clubs statewide to collect and donate backpacks stocked with school supplies for students served by the clubs. Boys &Girls Clubs serve as a haven for nearly 4 million kids each year, including thousands of children in need in Nevada. The drive is being organized by the Nevada Association of Realtors and its Leadership NVAR Class of 2016, the association’s signature program for personal and professional growth. Class members are seeking donations of backpacks stocked with pencils, folders, three-ring binders, highlighters, rulers, tape, USB flash drives and other school supplies at designated locations. Visit nvar.org for more information. The Public Education Foundation’s Education Hero Award gala will be Sept. 24 at Mandarin Oriental, 3752 Las Vegas Blvd. S.
Each year, the Public Education Foundation honors people who have demonstrated extraordinary commitment and dedication to children and education. This year’s honorees are Kirk Clausen as Education Hero, and Tony Sanchez III and NV Energy as Wells Fargo Champion of Children. The evening also launches the foundation’s 25th anniversary celebration. For more information, visit thepef.org/hero. Volunteers in Medicine of Southern Nevada invites the public to attend the eighth annual Volunteers in Medicine Ball at the Venetian on Oct. 1. The honorees are Drs. Harry Rosenberg and Renee E. Coffman, co-founders of Roseman University of Health Sciences and community leaders who support the group’s mission to provide charitable and accessible health care to all. The event commemorates the Lights of Las Vegas, philanthropic-minded individuals who support community organizations that help needy people. Festivities will begin at 6 p.m. with a cocktail hour and silent auction. Dinner, dancing and a live auction will follow. Findlay Cadillac and Findlay Honda Henderson donated a 2015 Chevy ES 15 passenger van to Nevada Partnership for Homeless Youth. The multipassenger van is valued at $26,000, and will provide staff and clients with a reduction in transport driving and wait times. The partnership has long struggled with easily transporting groups of homeless youth because of limited capacity. With the new van, the partnership’s staff now will be able to transport almost all of its clients at once. These trips include travel to the Department of Motor Vehicles, the University of Nevada, Las Vegas, educational field trips and other activities away from its drop-in center, the hub for many of the partnership’s services. Nathan Adelson Hospice is collecting items for its annual Back to School Supply Drive to help students at Robert L. Taylor and Sunrise Acres elementary schools during the 2016–2017 school year. The drive also will help Nathan Adelson Hospice’s Families in Need program, which assists families utilizing hospice care and employees in need. Desired items include backpacks, paper, crayons, markers, scissors, erasers, glue sticks, tissue boxes, colored pencils, pocket folders, rulers, binders, paper towels and zip-lock bags. Nathan Adelson Hospice locations serve as drop-off points through Aug. 22. Items can be dropped off between 8 a.m. and 4 p.m. at 4141 Swenson St. and 3150 N. Tenaya Way, third floor. Donations will be delivered to the schools before classes start on Aug. 29. The Las Vegas Convention and Visitors Authority’s Host Committee and United Blood Services have teamed up for a special event, the Host Committee Blood Drive Challenge, which started on July 18 and runs through Aug. 21. It is essential for the community to meet the demand for blood every year, especially given the more than 42 million annual visitors to the Valley and the Clark County population surpassing 2.1 million. About 240 units of blood are needed daily to supply local hospitals. During the Host Committee Blood Drive Challenge, community members are encouraged to visit any local United Blood Services donation center or community blood drive. Donors are asked to pledge their blood donation in support of the group’s blood drive challenge efforts by choosing a recipient from a list of Las Vegas businesses and organizations. To find a community blood drive or to schedule an appointment to participate in the Host Committee Blood Drive Challenge, visit unitedbloodservices.org/lv/or call 702-228-4483. Nevada State Bank is collecting school supplies and donations through Aug. 11 for Communities In Schools of Nevada, the local affiliate of the nation’s leading drop-out prevention program. Needed supplies include backpacks, notebooks, notebook paper, pocket folders, markers, crayons, colored pencils, gift cards, and uniform clothing for boys and girls. Communities In Schools of Nevada works in schools to assess the needs of students — from food, clothing and hygiene items, to mentoring and tutoring — making sure every student is empowered to stay in school. In 2015, Nevada State Bank colleagues donated thousands of school supplies, reaching more than 44,000 students in 43 schools statewide. All donations will be dropped off at the CIS bus on Aug. 12 at Sam’s Club, 7100 Arroyo Crossing Parkway. Mary and Sam Boyd Clubhouse has unveiled a new game room, thanks to a $16,500 Triple Play grant from Amerigroup Foundation. The grant provides updates in equipment and supplies for the club’s game room, which is the central hub for local youth to learn about teamwork and leadership, play educational games, participate in physical activities and form friendships. 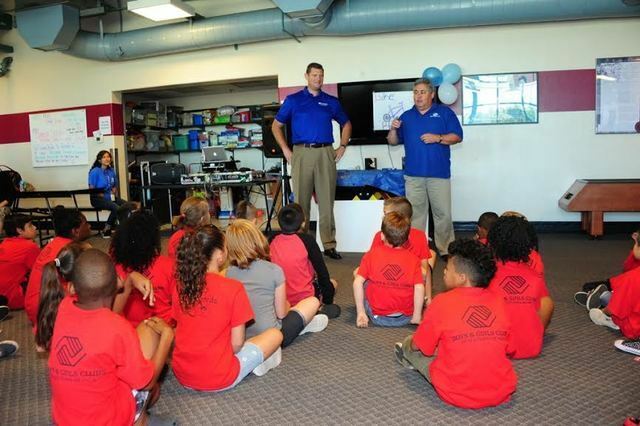 The ribbon-cutting event at the clubhouse on July 15 came months after a string of vandalism in early 2016, and featured representatives from Boys &Girls Clubs Southern Nevada and Amerigroup, as well as approximately 50 youth from Boys &Girls Clubs Southern Nevada. Triple Play is Boys &Girls Clubs of America’s signature health and wellness program. It motivates kids and teens to be healthy by providing nutrition and health education, access to healthy foods, and encouraging avoidance of risky behaviors and a commitment to fitness. The second annual Pigs for the Kids barbecue competition and music festival takes place from noon to 9 p.m. on Sept. 17 at Craig Ranch Regional Park. This year’s festival benefits Candlelighters Childhood Cancer Foundation of Nevada, Cure 4 The Kids Foundation and the Nevada Childhood Cancer Foundation. Inspired by founder Todd Radwanski’s daughter, Adilyn, who was diagnosed with a rare eye cancer at 9 months old, Pigs for the Kids was envisioned as a community event to support organizations such as those that helped the Radwanski family. Tickets are $10 and include one Piggy Buck, which is redeemable for food and drink as well as activities at the festival. V.I.Pig Passes are $150 and include access to the V.I.Pig Tent, exclusive parking, open bar, special chef dishes and 10 Piggy Bucks ($20 value). For more information, visit PigsForTheKids.org. Catholic Charities of Southern Nevada has received a $2,500 grant from Meals on Wheels America to help fund its pet support program for clients. The money will be used to provide food, supplies and care for the pets of Meals on Wheels clients, many of whom are seniors whose only source of companionship are their animals. Meals on Wheels America has granted $300,000 to 162 local programs this year through the Meals on Wheels Loves Pets initiative. Candlelighters Childhood Cancer Foundation of Nevada teamed with the Las Vegas 51s at Cashman Field on Aug. 6 for Superhero Night to bring awareness to the needs of children battling cancer and the issues their families face. The superheroes theme is a representation of the courage and strength kids with cancer exhibit every day. The fundraiser included a meet-and-greet with Batman and Wonder Woman, and — since gold is the color of childhood cancer awareness — the 51s painted a base and the first-pitch ball gold. A Candlelighters youth beneficiary named Tomier threw out the first pitch preceding the game. He was chosen as one of this year’s Superhero 5K Ambassadors. Ten Candlelighters kids then ran the bases with the team’s mascot, Cosmo, and the superheroes, and each of the 51s players signed a base that was raffled off during the game. Attendees had the opportunity to register for the Superhero 5K with KLUC’s Chet Buchanan. The race and walk will be on Sept. 10 at Exploration Park in the Mountain’s Edge. For Candlelighters and Superhero 5K information, visit candlelighters.org.